As summer break fast approaches, children will have extra time available to try and experience new things. For the month of June, Studio 237 Music School is offering week-long summer lessons for beginners through advanced levels. Each lesson is one hour long and runs for five consecutive days; you can choose your week. Each camp is $175. 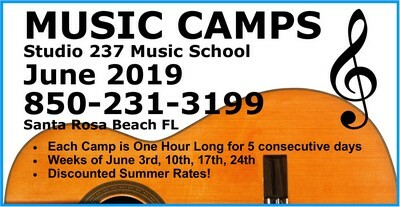 Parents as well as children can enjoy the 5 consecutive day lessons to discover music in a stress-free environment while learning about an instrument. Don’t own an instrument? The studio has instruments that the student may use during the lesson. Since the lessons are daily, practice is not necessary for the week. This is a great opportunity to experience learning a musical instrument, getting familiar with Studio 237, and meeting some of our teachers before jumping into weekly lessons this fall. We are also continuing private lessons at our regular daily rates. 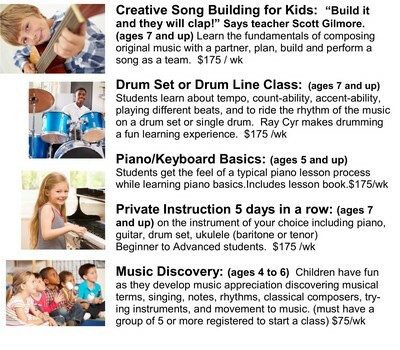 Call the studio at (850) 231-3199 to find out more about enrollment and visit our website at www.Studio237Music.com.